A horrible little feature with groovy music. It has the Seinfeld's Soup Nazi in it. Prostitutes, Hard Rock and Hard Drugs. That’s pretty much Terror on Tour. A horror movie of sorts. It features a punk-ish glam rock band called The Clowns. And I have to admit, aside from the cheapness of the movie, the band looks mildly cool. They have a gimmick of cutting up a dummy on stage and tossing the pieces into the crowd. Strangely enough, they kind of remind me of a GWAR meets The Adicts meets KISS. In real life, this band is called The Names. They appear to be a Cheap Trick inspired rock band. Check them out. These Clowns are stereotypical rockstars living the rockstar lifestyle. They appear to play at a single venue in some unmentioned city. They also hold parties at there. Unfortunately, girls start turning up dead. Murdered brutally. The cops are suspicious of the band and want to name them as suspects. Rick Styles, Chip Greenman, Rich Pemberton and Dave Galluzzo are the band. All of them are terrible actors. They couldn’t carry this movie at all. The Seinfeld Soup Nazi is in this movie too. Larry Thomas plays Tim, the manager of The Clowns and all-around scumbag. 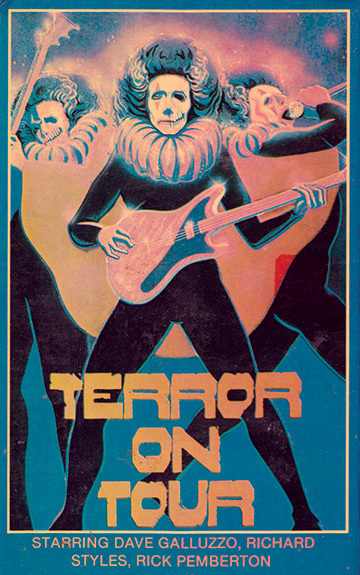 Terror on Tour is not a good movie. I thought it might be slightly entertaining. But I was wrong. This movie is cheap and I guess that’s the most frustrating thing. The audio is crap the scenes are out of focus. It’s true garbage. A sleaze picture really. Somehow, I ended up not hating it. But that was a slight nostalgic charm if anything. Before watching, I know these movies are mostly going to be bad and I still love them. This wasn’t a very good movie but I liked experiencing it.